A quick post of a quick edit. Will be using this shot as a personal reminder to revisit Queen's Park in Toronto soon, since the day I took this I was forced to handhold a camera balanced on a railing to get a halfway decent exposure in such low light. Tripods were not allowed the day I was visiting due to the volume of people traveling through on tours. But return I will. Why? For a better shot of the rich and historical interior of the Legislative Building. It's quite stunning. And this photo really doesn't even begin to do it justice. It's alright, but it's not the best I can do... am I allowed to say that? But I always make a point of returning, a little more prepared, a little more aware... dare I say even a little wiser (wiser? more wise? do we have an English major in the audience?) This is the joy of photography for me. I don't have to sign up for workshops (although if I had the money, there's an African safari shoot with photographer David DuChemin next year I'd be signed up for quicker than you can say "Bob's yer uncle! "), I don't have to go to school, I don't have to disappear for years to follow a photo guru to the corners of the world... I can make myself learn. I can look at this picture and if I use my noggin, I can see that I need to find a way next time to lower my ISO, use a faster lens instead, aim for visiting on a sunnier day with the glass ceilings letting in more light. That's just the tip of the ol' ice burg. If you're struggling with getting better shots and don't know where to begin, look at what you have taken. Common, really LOOK. What's missing, what would work better, what didn't you have? And look at everyone elses work online and in books. Compare them to yours. Then decide to learn what it will take for you to get it next time. I'm a huge fan of libraries... photography books you can devour at no cost. And then... you pick up your gear, and you get back out there. I may not always post a winning shot, but if I let that be the criteria for being a photographer I'd never take another image. And that's not an option for me... now where's my own gear? I need to take some photos, and learn a few more things. I need to explore. It is after all, Exploration Thursday. Have a great long weekend Canada! And to our American friends as well! While you enjoy it, pull your cameras out and have fun learning what not to do! Thanks for the ramble gang! This is a bit unusual for me, but today's Mono post is a little more rich in tones than most... but still monochromatic so no worries. This is another shot from the series I took while learning more about using my flash off camera. Back when I had free time. But I digress. Sepia effects aren't my all time favorite type of monochromatic conversion, but sometimes the subject dictates how you edit. And whether it's not my favorite use of converting to mono or not, the warm tones of the sepia really bring life to this image more than any B&W conversion would. Simply put, it suits. What I love about sepia is that it starts with such a flat effect, but put her through curves in editing, add some clarify filter at 4%, and finish it with Nik's Skylight Filter which makes highlights sing, and hues and tones brighten even just at 25% on the slider... and you have the perfect portrait of the ol' girl. At least that's my humble opinion. Sepia certainly has it's uses... when I first started out in photography the trend was toward overusing it on everything, much like the HDR trend of today but I'll not get started on that rant... yet. But your digital darkroom allows sepia to really make a statement these days. Oh, and P.S.... if your camera lets you switch to sepia while taking the picture, avoid this and do it later in processing. Then you have all the control instead of your camera making choices for you. But again, I digress. Sepia. Not my ultimate favorite way to edit, but beautiful none the less given the right subject. Thanks for the ramble folks! And hey, only 2 more days to vote for this blog at Circle of Moms (the big pink button is over at the side, please click to vote!) and then we'll see where we land when the dust settles! Thanks to all of you who have been voting so faithfully... you're the best cheerleaders a gal could have! A Rosie Rant! ~ Floral Friday! 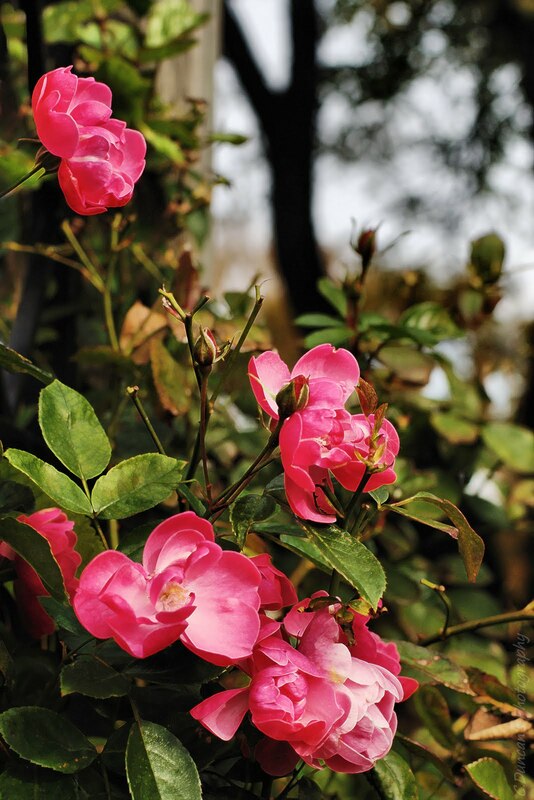 It's Floral Friday, and today's shot is from the Gage Park public rose garden. These lovely climbers are fairly mature already and climbing nearly 7ft high and it's only June. Why is this significant you ask? I'll tell you. Apparently a few unscrupulous people over the years have coveted these beautiful roses that the city staff work so diligently on, and when no one's looking, out in the park late at night... they STEAL them!!!! Yup. Dig them right out of the ground in early spring. The staff come out in the morning in April or May... and whole plants are missing before anyone has a chance to enjoy them! Me and my Nikon included. And according to a reliable source, the most popular night to take them is right before Mother's Day! So if you've gotten the lovely surprise of your kids planting roses in your garden without a heads up and you live in the Hamilton area.... well, I'd ask a few follow up questions. The other amusing part is that the climbers are grown in pairs, flanking the pathways... so often the rose robbers pluck out the matching plant opposite it too! This gets my goat! (sorry, arbitrary inclusion of an antiquated exclamation) I mean really. These are beautiful flowers, maintained all year round by caring staff for us to walk through for free, to enjoy, to photograph.... but NOT to touch. Let's respect our green spaces folks, and the people who work so hard to make them beautiful for us. And if you so desperately want a rose bush, just ask the staff. I'm sure they'll start you off a little snip if you're so interested. Or, you could just spend ten bucks at the local greenhouse. There's an idea. Whew... sorry for the rant. But I'm so tired of people waltzing through life with no regard for who else will be hurt by their actions. Let's get out there and enjoy our public spaces AND keep them public. Eventually, the city may give up, and remove them altogether. Then I'll rant for sure. Thanks for the ranting ramble. Get some roses in your cameras this weekend! And have a great weekend. Can't Beat Backlit ~ Exploration Thursday! "Scottie and the Summer Sprinklers"
Back lighting. It's an excellent way to give your images an extra edge. I sometimes forget this. So preoccupied with getting nice sidelight, proper shade, or fill flash to combat direct sun hitting a subject. But life would be more interesting, and I dare say easier at times if I'd remember how dynamic a photograph can be when it's shot with back light. So how do I forget this important technique? Took this last summer at the pier with my friend and photog partner in crime Kelly one night. The light is low, skimming across the sprinkler park while the sun starts to set. This becomes ideal for back lit subjects or scenes. We had a hoot (yes, I used hoot. Who doesn't these days?) 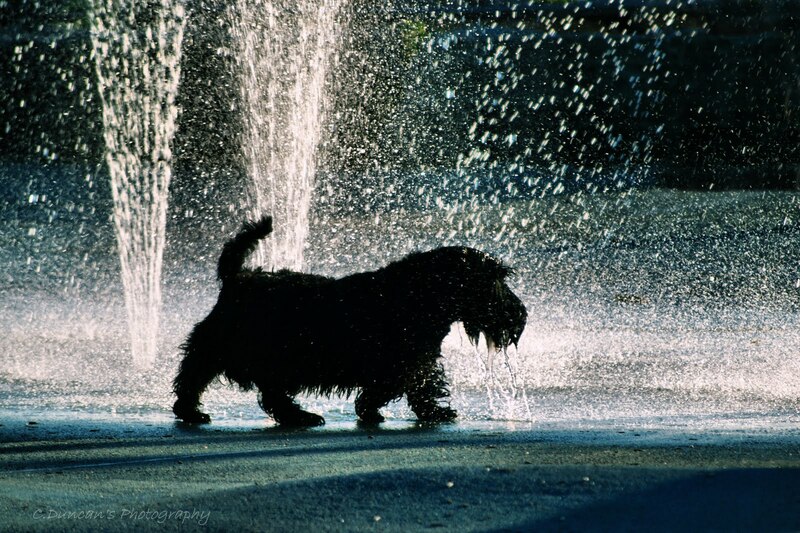 watching this little dog frolicking in the spray with as much abandon as he's stubby little legs would allow. I raised my camera, and metered off the spray, choosing to blow out the highlights a bit more than normal so that the pooch wouldn't be pitch black... and waited till he frolicked a little more towards the light as well. I shot a few frames then realized it could use some help, so I went into my exposure compensation and dialed it up a bit by +0.7. This made everything in the light pop and the shadows a little less dominant. In the end my exposure was 1/400 sec. @ F/7.1, ISO 160 with my 200mm zoom. I froze the dogs steps as well as the spray shooting upwards. I'm thinking I need to shoot more back lit subjects soon... it's been too long. Anyone wanna run with abandon through the sprinkler???? Have a super night gang! Thanks for the ramble! Considering I'm trying to finish one photo session and begin editing two more, I'll keep today's post short and sweet. Do you hike? Our family loves to hit the trails with a good walking stick or two... and the Nikon. Sometimes we spot deer, fox, woodpeckers. Sometimes we spot poison ivy and keep moving. I just love how quiet it gets, how the forest whispers in a breeze, and how if you look carefully, the trails tell you a story. It's the story I like to try to photograph. Here's the deal with the image above. Think late spring, new leaves not yet mature enough to block out the sun, plenty of natural debris on the forest floor for little critters to live in and under. Heavy bright green moss since there's been so much rain... and what's this? 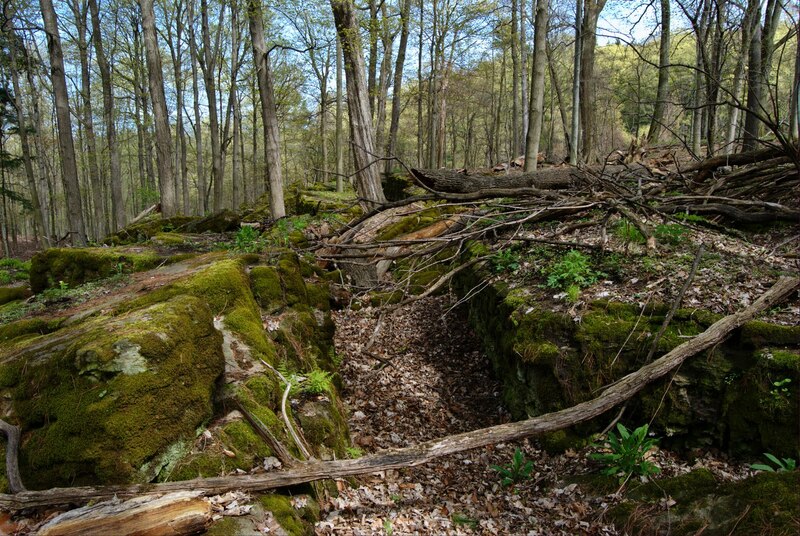 Down between the rocky karst, the remnants of a creek bed gone dry. I love that it once ran downhill towards me as I wandered off the beaten path, but that if you look carefully you can see that the whole scene runs downhill off to the left of the composition. Uncanny. I've photographed this trail, the Hermitage Trail, often and my goal is to shoot it year round in 2011. I've wandered it alone, with my family, and with my good friend Kelly (and lovely photographer in her own right) many a time. But this will be the first year I attempt to let it reveal it's stories while I shoot... to see what the end result may be when I put them all together. Frequent a favorite location with your cameras folks. You'll never run out of photo opportunities. Trust me. Thanks for the ramble, and have an awesome day! And if you'd do me the honor, please click on the voting badge from Circle of Moms for me? Only 7 more days for me to try to stay in the TOP 25 Photog Moms! For those who have diligently voting, a huge thank you! Flowers for Dad ~ Floral Friday! Floral Friday is going to be a super busy day for me... so let's keep this short and sweet so I can hop on the train to Toronto and start this weekend! Whoo hoo! And on that note I'd like to dedicate this post to all the Dads out there for Father's Day! Yes, I know it's a flower image. Yes, I know it's pink. Yes, I know most dads would rather see an image of classic cars, hockey players, or their favorite golf course as the sun goes down whilst and at the same time the subject gets a hole in one... but you'll have to make do with this one. You're welcome! I have had the privilege of having a wonderful and wacky father, a lovely father-in-law, and watching my husband be an awesome Dad to our two kids. Men who honor their families with everything they do, who are spiritual rocks you can count on, and who have worked to support all their family's endeavours with their whole hearts. Who could ask for more? So to all the dads who cheer at soccer games in the rain, all the dads who've played chauffeur late in the night with a car full of giggling teens, all the dads that hand over the contents of their wallets for various and fully explainable reasons on a weekend and only complain a little about the volume of that "noise" they call music... this Sunday is YOUR day. If your dad has ever gone beyond the call of duty, or is someone you maybe haven't honored in a while for various reasons, nows the time. Cause you only have one dad. Make this weekend count somehow folks, and dare I say honor him all year 'round and thanks for the ramble! A Bloggy Break ~ Exploration Thursday! Here I am in the middle of my biggest editing week so far. It's been good but it's been busy. And next week will be much of the same. I've realized that I appreciate being able to blog more so during my crazy weeks than any other time. Why? Because for a few moments I can do something completely different from my work editing (which I still find exciting don't get me wrong) and just interpret a more personal photo my way. It's my equivalent of getting up and stretching for a moment at the computer in the middle of the work day. Some of us head over to the water cooler, I head into my personal photo files and take a deep breath... ahhhhh. 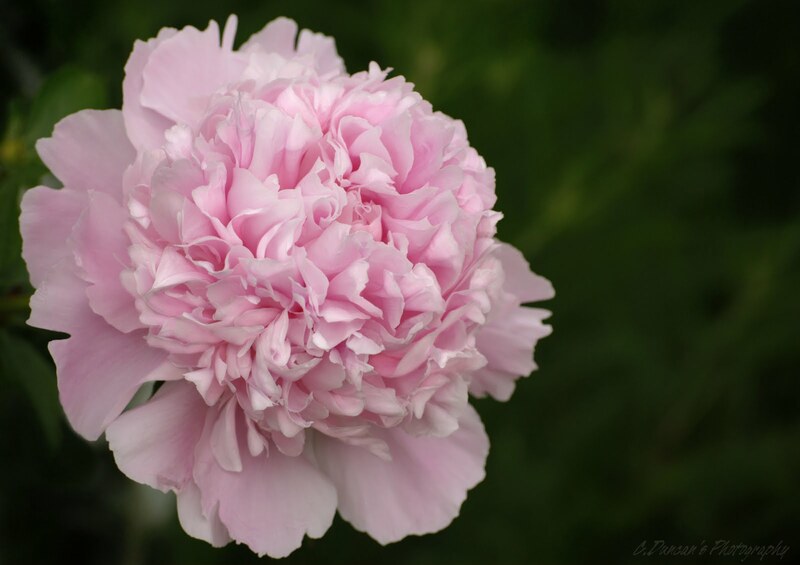 So here's a peony shot I took last weekend on a much needed break. I played with this in Corel... made a few layers and got some different soft colors, perfect for this flower. I duplicated the original layer in full color and converted it to sepia. Added a contrasting adjustment layer to it so to make the creamy areas pop slightly. But then I played with it's opacity a bit to remove any shadowy tones that were too heavy for this shot. Some slight pink was starting to show through from the color version underneath. I unlocked the original layer underneath, then when back to the sepia layer and with my eraser tool I began to reveal certain individual petals from underneath that had nice color and could make the overall image include some depth. This wasn't as time consuming as you may think, and again, it was nice to just play without the pressure to please anyone but myself. I liked the final result immensely and it was just the break I needed. I hope to be able to show you a shot or two from one of my sessions next week so you can see what I've been so busy working on for the last two weeks, but until then I'll get my fill of peonies! How do the rest of you photogers relax from photography work? Switch to personal projects? Hide the camera away and have movie marathons? Take the family for a hike? Whatever it is, it usually feels good no matter how much you love your job. Glad to know we're all the same! Thanks for the ramble folks! Have a wonderful and blessed Thursday. Flash & The Fiddle ~ Telephoto Tuesday! Well as promised, I've managed not to smother you all (yet) with peony pics. That's only because I've been waiting for this week's telephoto theme day! Pictured in today's post is my fiddle. Actually, it was graciously handed down to me by my in laws several years ago with the stipulation that I continue to learn how to play the ol' girl. And play it I do, usually late in the day to one of my slower Celtic Cd's on the stereo. Jigs are not my forte. Yet. I've been in love with her full bodied sound, her color, her shape, and her history. So I figured she deserves a much better portrait than what I was able to supply until recently. 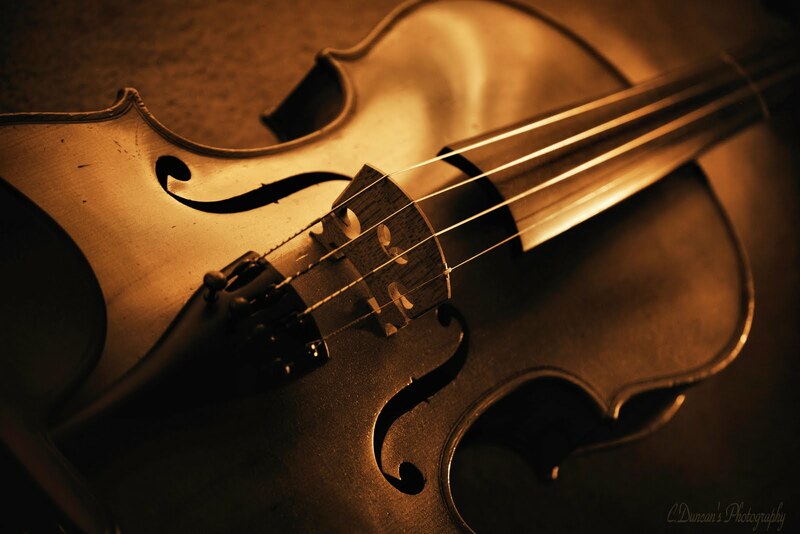 I've been waiting for ages to learn how to better use my flash so that I could get a photo of my fiddle in more dramatic lighting. This is my first attempt, and I will continue to tweak my settings in camera till I get the exact look I'm looking for. But this step was big for me, as I finally figured out the nuances of shooting with the flash off-camera. 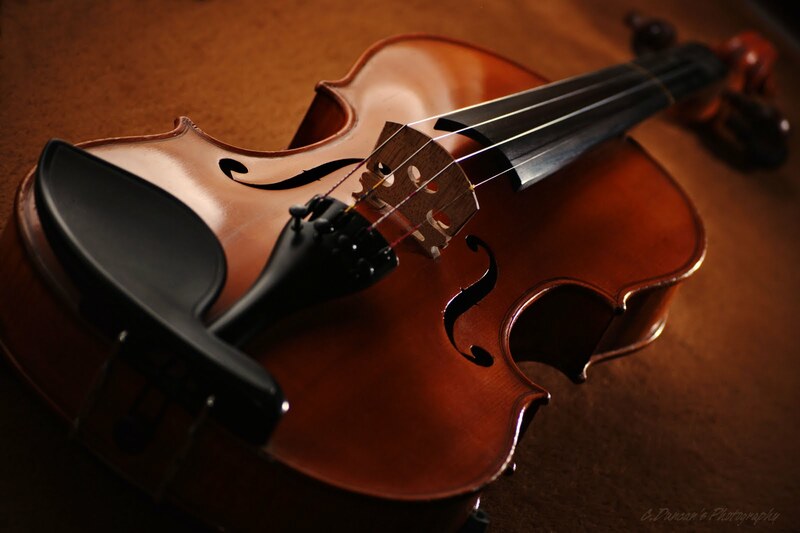 Especially using a light panel to soften available light coming from one direction, and a reflector to bounce the light off of to get light that would skim across the fiddle from near the top down, kissing it's shape without being overwhelming. It took time, patience, and some experimenting. Especially since the spot I used is in a dark blue room that eats up the light almost instantly. But I knew I wanted deep color and a darker backdrop so it worked out that the one window in the room has an old window seat in deep browns perfect to lay the fiddle on. Low light enabled me to really see the effects the flash was having, and to create an intimate looking still life. To use Nikon's speed light off camera, you have to use your small on-camera flash as the trigger. This meant dialing down that small flash's output as low as it would go so that from the distance I was at with the telephoto it wouldn't give off too much light while trying to get the right light out of the SB600 placed opposite me. Thanks for the ramble folks! I'm still swamped with editing but all is going well... hope you're all having a superb week! 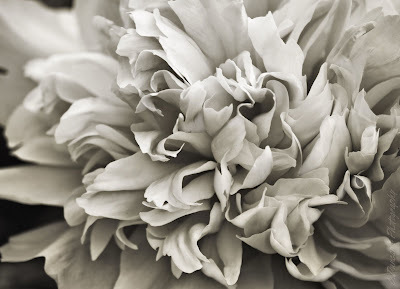 Peony Love ~ Mono Monday! I love love love peonies. Love them. Every aspect of them. Their scent is what heaven will smell like, I'm sure of it. That's heaven wafting through my window and across my work station right now. Their shape, their delicate profusion of petals like all the ruffles on a lady's skirt. Their sweet subtle colors. 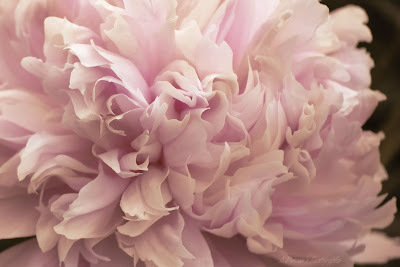 Out of everything God created for us to enjoy, I think the Peony is His most beautiful and poetic. Did I mention I LOVE peonies? They're in full bloom right now in my garden which means I make time each day to run out there with my camera in different light and weather to get tons of pics. And I promise I'll try not to smother you in peonies all week... but hey, I'm prone to be a little less motivated to keep promises of that nature right now when they all look so darn delightful! Mono Monday, so I have taken one of the close-ups I got this weekend and converted it. But a straight conversion didn`t yield the nuances of each petal the way the color version did, so some layers work occurred. After creating a duplicate layer of my initial conversion to the platinum B&W in PSPx2, I made sure I took the original layer into the adjustments menu and really brightened the overall image, more than usually necessary. Then in the duplicate layer I applied the B&W to the Curves option, taking the highlight and shadow points to areas where they made both extremes pop. The duplicate layer`s opacity was opened up slightly and then I proceeded to use the eraser tool to reveal the really bright layer underneath only in areas where there were natural highlights on the edges and topsides of petals. The image began to take on a depth it needed from the original conversion into B&W. A little time consuming, and required some vision as to what I really wanted to be important to this conversion. Am thinking already that I need to do this again in a really true B&W option now, that I may like it even slightly starker than it is now. And that`s okay. Some images evolve. Your vision for an image will evolve, change, improve, become riskier. It`s called art. And more than peonies, I love art. What do you love? And have you pursued expressing it lately? Or taken the risk to show it to the world? ....More peonies anyone? Thanks for the ramble! It`s an editing week for me, so except for the blog I may be off the grid for a bit... so have a fabulous Monday! Oh, and shameless plug here - please be sure you click on the pink vote button on the right side of the blog for Circle of Moms to place my photography in the Top 25 Photog Moms! You can vote daily! Thanks! Labels: Black and White, Canada, canadian photography, Corel, Flowers, Mono Monday, Monochromatic, Nature, peonies, Vision. B&W Beauty ~ Floral Friday! Well, I did promise Floral Friday here at the blog and deviated from the Doors Open theme. But thought I'd stay with my theme of B&W that I kept with also through the week. I'll be curious to see what your thoughts on this are. When I thought about the perfect flower to convert into mono tones, orchids came to mind... unique shapes, great veins of texture, and a bit of a compositional challenge when you lack a macro lens to fill the frame with. The Platinum fx filter in Corel is lovely to work with, or at least, it's become one of my personal faves. When you take it into the curves function in PSPx3, you can fine tune every tone, every shadow, every highlight with a nice depth that is a little less stark than a classic B&W option. Perfect for floral shots. But that's just me. Every artist has their own approach. In a separate layer I added a bit of subtle texture, and with an eraser tool erased most of the clean background revealing the canvas effect underneath, leaving the flowers for sharpness. I merged the layers when I decided I had achieved the right opacity. Otherwise, the background was too bright for the image. I shot this in my kitchen actually. 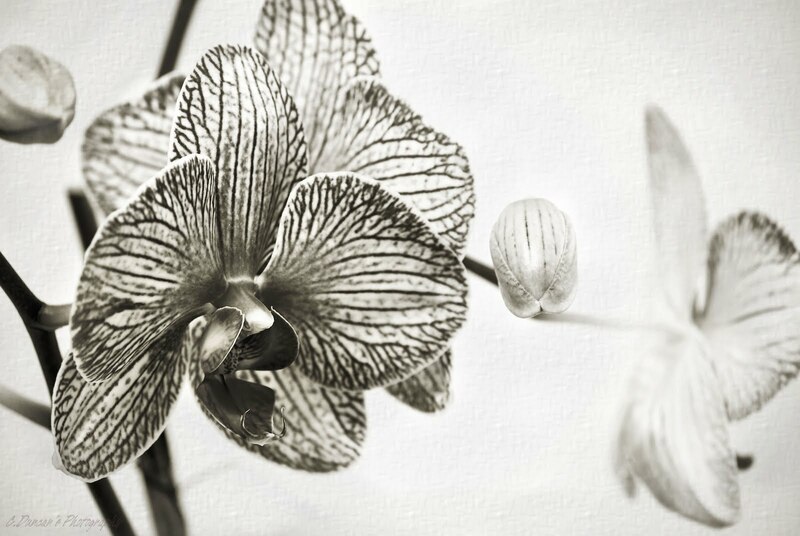 I was playing with window light, a cheap white sheet stretched across the window acting as a diffuser, and my telephoto to get in close to the orchid in the foreground, blowing out the backdrop slightly and using a larger aperture so that I could get a much shallower depth of field artistically. Enjoy today's image folks, and thanks for the ramble! Have a fabulous weekend and please remember to click on the Circle of Moms badge on the right hand side of my blog page if you've been enjoying my photographs! Thanks everyone who has already voted! 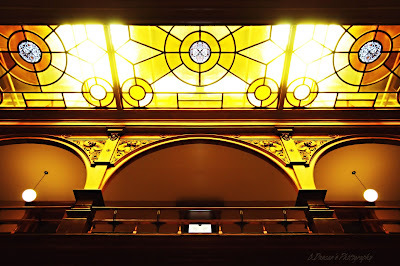 Inside Looking Out ~ Exploration Thursday! Do we see a theme this week? Lot's of stone, walls, windows, doors... I'm going out on a limb and hoping you're not too tired of the Doors Open TO series I've been working on. If you are, relief will be on the way in the form of trusty ol' Floral Friday tomorrow. But in the meantime, here's one more B&W I was wanting to post. 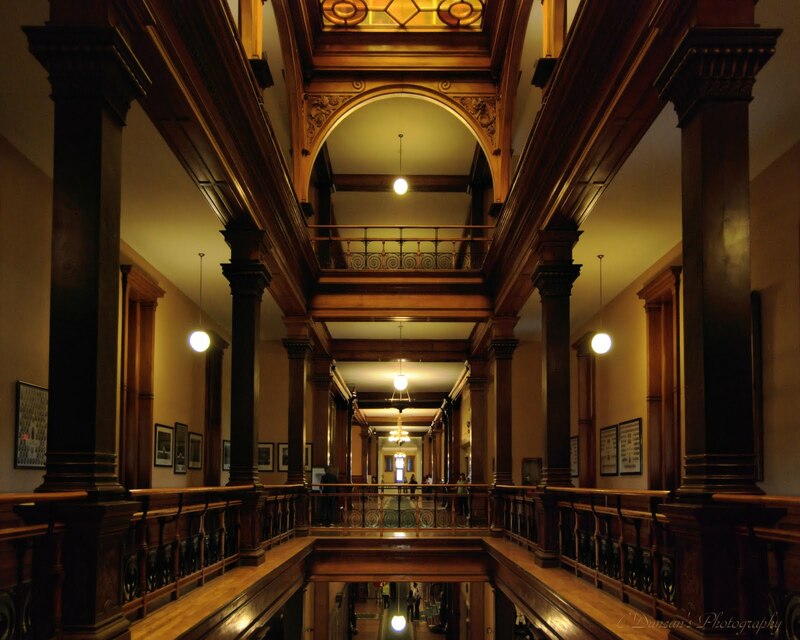 This is a view of the Ontario Legislative Building that you may not normally see when at Queens Park. Or you may see it but only give it a passing glance. I did. Then I got to the end of the hall and went back. This is where two slightly different parts of the building's architecture come together in the rear of the property. And if you look carefully you'll see this was taken looking out one of the windows in the hall right along the side of the building that stretches out in a U shape from inside. Quality-wise it's not the cleanest shot. The windows facing this more remote part of the building were a wee bit dusty... and you can see it where the image softens along the edges where the light was starting to reflect off it. But I like the shot none the less. It's simply an interesting perspective. I suppose because I rarely get to shoot these buildings from anything but street level that this seemed like a nice opportunity. So there it is. And in a platinum B&W in PSPx2. Shooting inside looking out seemed ideal for Thursday's post where I try to mix things up a little somehow. Next Thursday I'll have a new guest on the blog and I'm looking forward to picking their brain a wee bit and exploring photography through their eyes! But in the meantime, I'll try to have some new subject matter for you all next week. Pinky swear. Have a great day gang, and thanks for the ramble! If you get a chance, please click on the voting button on the right hand side of my blog and let's see if I can't get to the Circle of Moms Top 25 photo blog list! I only just signed into Circle of Moms, a great online community for moms who blog and more, and I'd appreciate your vote as one of your favorite blog sites! Thanks so much to all of you who have already taken 5 minutes out of your busy days to do so! Have a good one folks! Here in Hamilton, it's a bit toasty today and I believe my brain has indeed melted away... I have been racking it trying to think of a good story to go with today's image of the Canada Life building from my jaunt into Toronto. But I've got nothing, except whether I really could fit myself and some basic living essentials into the fridge for the next couple of days, to ride out the heatwave and chill what's left of my brain. The next time you hear from me I could be writing from the crisper. 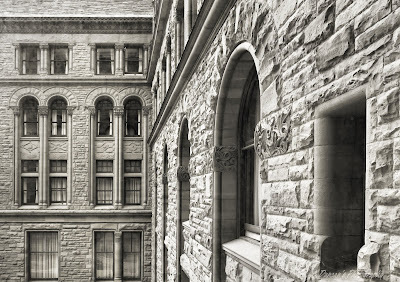 The Canada Life building is not normally open to the public so the street level and entrance were swarming with visitors when I took this, but it's upper exterior boasts some classic architectural elements and that's good enough for me and the Nikon. One of my favorite approaches (and overused to be sure but hey it works) is to stand underneath the exterior and shoot up against the building. Obviously using a wide angle. 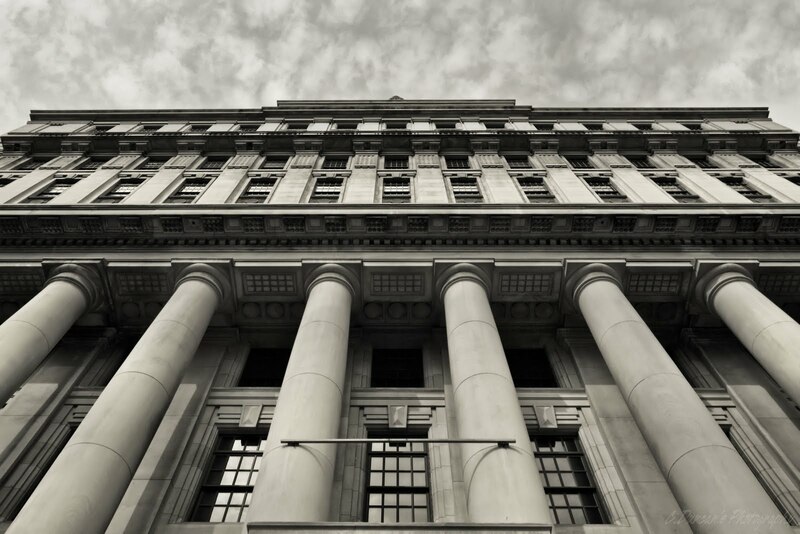 This building's size is it's best feature with the massive columns, and banks of windows. And always, with common everyday sun mid morning, I knew this would look best in B&W for now. No matter what your subject, your first question to yourself should automatically be "what is it's most impressive or evocative feature?" It's your starting point. It'll lead you to more detailed or interesting views as you go. But that first impression... if you can get that in your lens, then chances are it'll grab someone elses attention too. Seems obvious, but sometimes we can be so consumed with being unique and getting the shot that's never been seen before that we can overlook the perspective that might stop anybody in their tracks, regardless of whether they love photography or not. And since you're still reading this blog and it's obvious I'm not renowned for my amazing info on camera tech, amazing apps, and genius use of overwhelming gear jargon... I'm going to assume you just like photography period or that perhaps this image is what drew you in for the first time. I guess that's my point. 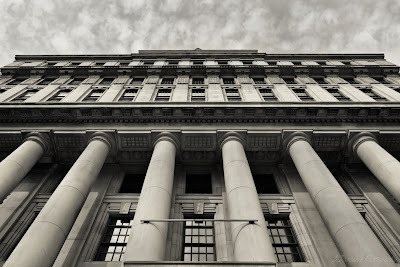 No matter what other scenes I see, or amazing photos are being produced around the world, I'm still a sucker for some great old fashioned architecture and a little B&W with the wide angle. What's out there that never fails to draw you in? Thanks for the ramble folks, and I hope you were able to keep cool today without having to resort to living in your refrigerator... like me. See you when I defrost! Begging To Be Photographed ~ Mono Monday! I do believe this may be my favorite shot of the year so far. And I wouldn't have even gotten it if not for some prompting from someone else. Friends and fans suggest locations to me all the time. Something they think would be worthy of a photograph. And sometimes they're right, and other times it doesn't work out. But my own brother has a great sense of design, and when he can't stop raving about a location that's a pretty strong indication that I need to explore it further. And he would not stop talking about this door. He didn't just talk about it, he phoned about it, he texted about it, and I'm sure if they still had carrier pigeon, he would have used that to drive home his point. Under no circumstances while in Toronto for Doors Open was I to miss the University of Toronto campus... and this door! I gotta buy that boy dinner. This is the massive and ornate entry way to the Arts Centre on Kings College Circle. I will return and shoot this building repeatedly, I can tell you that right now! 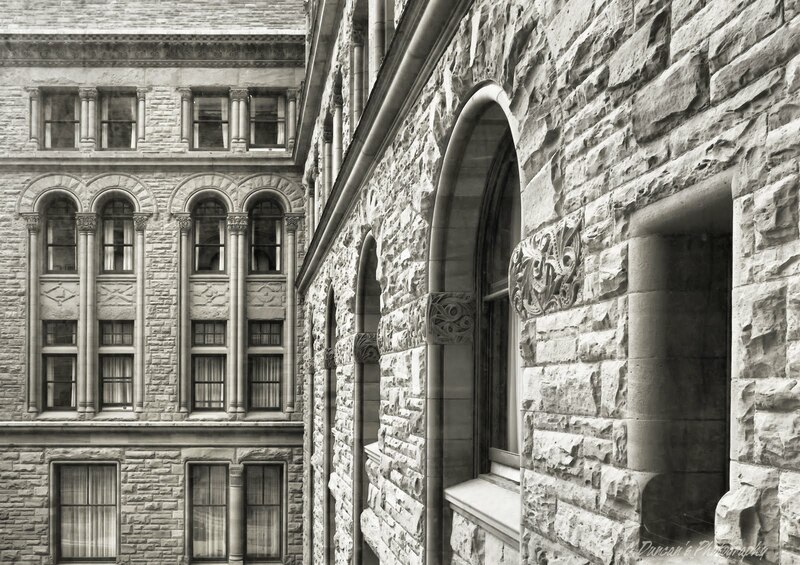 There's so much architectural detail, and that's putting it lightly. 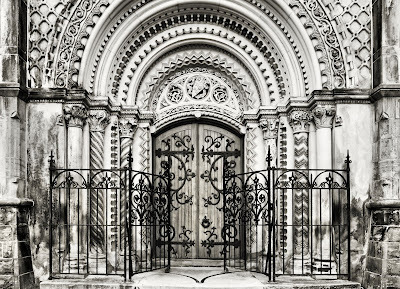 The entry way boasts very detailed and ornate designs from the Romanesque period, arches inset into more arches, and finally a solid and heavy wooden door surrounded by gates on a brass or copper track set into the stone steps. It has been saved as a National Historic Site, and the entire property is regal and powerful looking. 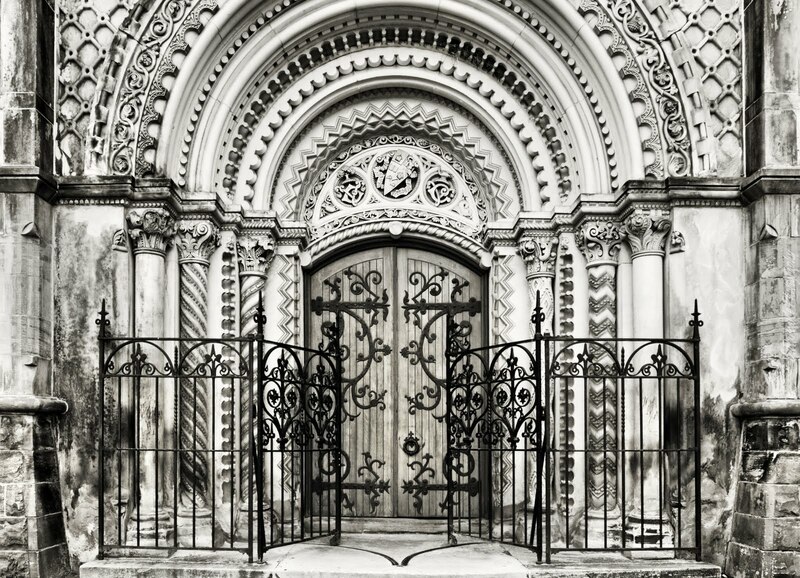 I knew though once I located it, that just the door itself was beautiful enough to be photographed. So I worked around other folks posing for cameras in front of the massive entrance, and took the time to decide how to compose around the other obstacles and the close street proximity as well. I got low, I half straddled a railing that runs up the center of the steps approaching this shot (classy looking I'm sure) and centered this puppy as levelly as I could when the crowds dispersed. I knew this would be B&W. I do have a color version up in my galleries on my website, but the monochromatic version is the winner hands down. It allows all the detail and texture and patterns to take over. I converted the raw file into a platinum B&W in Corel, I find anything with stone looks stellar in this effx option in PSPx2 or x3. I applied some curves to it to make the dark areas more rich and the lighter areas brighter. Then modest highpass sharpening. And there it is. Like I said, I believe this may be my favorite of the year so far. I knew I had to share it with all of you. Thanks to my brother who's keen eye spotted this gem, and for convincing me to seek it out. When I spotted the massive entrance across the field at the center of Kings College Circle, it immediately beckoned to me. I understand his insistence fully. In fact, I'm hooked on the whole campus. Thanks for the ramble and the unveiling of this image I'm so excited about. Have a super day folks! Irises On Display! ~ Floral Friday! Ahhhh, June is here! And with it comes two of my favorite flowers, the Peony and the Iris. In fact, my garden is about to spill over with both and I'm sure the neighbours will think I've lost my mind yet again as I creep about the front yard in the early morning or late day, laying on the ground shooting up into the blooms, or crouched down in the midst of them with just my head visible. I've surprised more than one person innocently walking past the house with "I got you!" only for them to realize I'm stalking my flowers and not the general public. It's embarrassing.... but they'll get over it. I will say this. 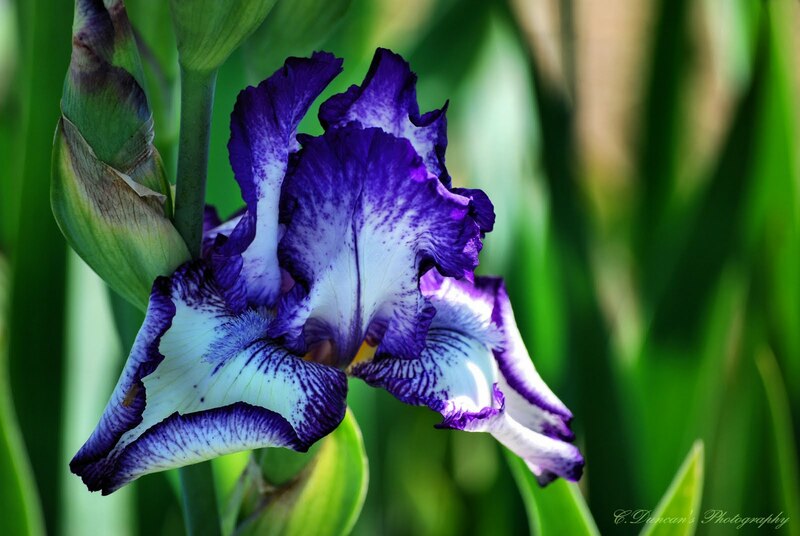 Irises often confuse my sense of composition. Their unique shape sometimes stumps me when it comes to getting more unique shots. A change in my approach will be needed this year in order to get new compositions out of my flower bed. Perhaps the lens fairy will lend me a macro for the day... one can only dream! What I love about them is their colors. Always fresh looking, very elegant, and any color you can think of. Shoot if you can on a day with overcast light and you've got it made. Catch them just after it rains (like I have yet to do, but I'm workin' on it) and they can look magical. Irises and peonies will be here on the blog more frequently for the next while! Can't wait! Thanks for the quick ramble, and have a fabulous weekend folks! "The Red In The Rubble"
Nothing overly bizarre done to today's image. Not that I do anything overly bizarre to any of my images, but it IS Exploration Thursday. Instead, I've posted this simply because exploring the city has always provided some interesting material. Older buildings in several stages of urban decay, getting a chance to be rebuilt and saved for new purposes interest me. 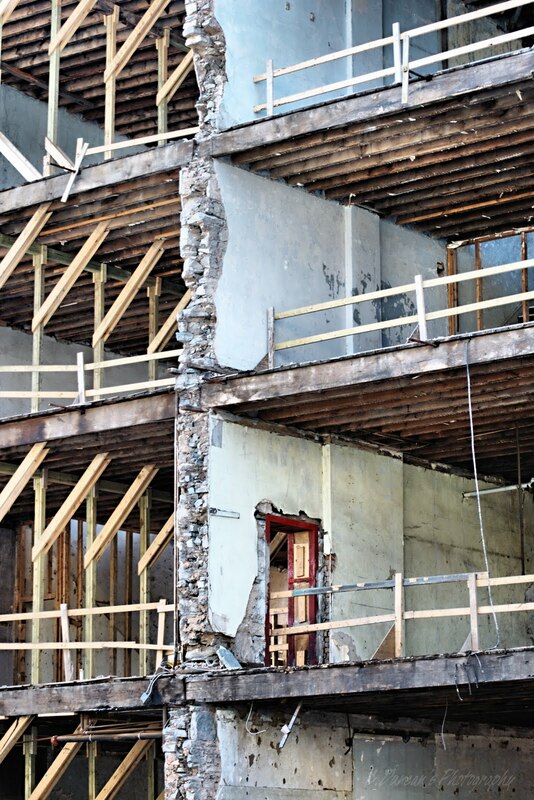 Taken back to bare bones gives us a glimpse we don't usually get into the innards of a building. Surprises lurk within. Like the red door. They've been peeling back the layers of this old defunct building for months. Nothing unusual for Hamilton. Lots of revitalization being bandied about, and some of it gets the go ahead. I keep an eye out for the tear downs, there's always something to photograph. This building hadn't shown me much promise until last week. 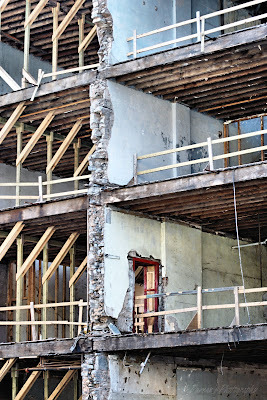 Then, out on a photo walk, I glanced up and noticed they'd knocked back more walls and whatnot, and I had a red doorway staring down at me. There was only one. I pressed the shutter and felt relief. I wanted to photograph something on the work site. Had hovered around it on more than one occasion. There's a feeling of great satisfaction that comes with finding the approach to a shot you want. And then getting it. All that happened with this midday telephoto shot was to make adjustments in curves back in PSPx2 and some highpass sharpening to make detail in the shadows more visible. Am wondering if I should convert this to B&W and do selective color just on the red doorway. That may be a project for later, as I prep for some session work next week and will be lucky if I can just blog images already finished and ready to post. So we'll see. Thanks for the Thursday ramble folks! Hope you're having a lovely one! Another post from the Doors Open TO Event. This is the Victorian style lightwell that shines down on the east wing of the Ontario Legislative Building at Queens Park. It was beautiful. It was regal. It was the only light source that made it possible to photograph the cavernous space full of tourists and photographers on Sunday. I'll say this for the rest of my life... interiors are very tricky. Tripods were not allowed, and I cringed as I took each shot because with the surging crowds of visitors I had no chance to balance the camera on something like my kit bag or a railing to use a lower ISO and slower shutter speed, and no offence Nikon, but unless you're using a more expensive body, Nikon's higher ISO's (starting at 250) become very noisy/grainy. And the more I have to fix that in PSP, the less detailed it becomes. And that's working in Raw. Guess I'll see how she prints. Knowing that my high ISO was going to cost me, I chose subjects that were fairly architectural with nice perspectives and interesting light. And in areas where I could lean against a pillar or railing for a few seconds to steady my shots since I had to be tripod-less. And I'm sure there's tons of similar shots being posted to flickr and such right this second, but I still needed to try my own approach to this anyways. If you don't shoot, you don't learn, and you don't improve. And trust me, I still have so much to improve! Thanks for the ramble today folks! Hope you're all improving your craft too! Have a super day gang! See you all tomorrow!